I thought about going into a bit more about the history of “instructional design” (ID) but it just didn’t fit into my video, and to some extent the Wikipedia entry does a decent job of it. But it’s key to understand that “instructional design” and the ADDIE model really comes out of a context of training, primarily in the military, in the 1940s and 50s, and then evolved through workplace training more than education. Thus traditional ID, as it eventually morphed into the education world (I’d suggest initially with the use of technologies imported from training contexts, such as educational TV, “programmed instruction,” etc. ), brought with it a big emphasis on behavioral objectives, measurable outcomes, carefully planned instructional sequences, etc. None of which are necessarily bad things, but taken too far (IMO) has helped to lead education to over-emphasize content standards and high-stakes tests. Thus, for me, “learning design” and the design process you outline above isn’t just another term for “instructional design” – it’s actually a corrective that takes into account a much richer understanding of how people learn in a variety of learning environments. Oh, and by the way, I don’t think the Wikipedia entry on educational technology is particularly good, and the quote you cited above is one of the prime reasons. Educational technology is so much broader than “… facilitating e-learning…”. IMO educational technology encompasses the entire toolset that educators and learners employ in the teaching & learning enterprise. Sometimes it’s helpful to narrow the view a bit for the sake of discussion, but in the grand scheme of things, books and chalk are educational technologies, collaborative learning and metacognition are educational technologies, how learning spaces are designed and furnished are educational technologies. So absolutely yes, pedagogy, instructional/learning design, and educational technologies are very tightly bound, and the boundaries are quite blurry. Thanks Jim and Vanessa for commenting on my post. Yes, learning design is a more appropriate term than instructional design, and it is good to know something of how thinking evolves over time. In relation to “educational technology”, Jim’s right. The Wikipedia definition is pretty shallow. I should have considered it a bit more. He’s also right to point out he scope of educational technologies. After all, writing is a technology, but somehow we seem to be forgetting such things at the moment. I first met the term Instructional Design in the context of workplace training and never liked it. So I too am very happy to swap it out for Learning Design, especially since I am not actively teaching/instructing but instead involved with (and thinking about developing) *learning* projects (my own and SRL for others). 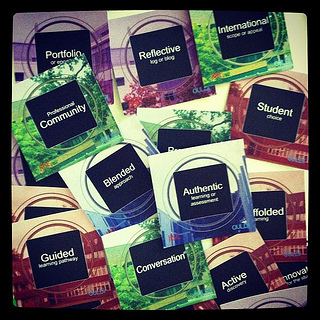 I solidly recommend anyone to take a look at the OLDSMOOC learning design resources. In fact, I wonder what a professional learning designer would make of them.